Smoked cashew cheese recipe that is sweet, creamy and very moreish. 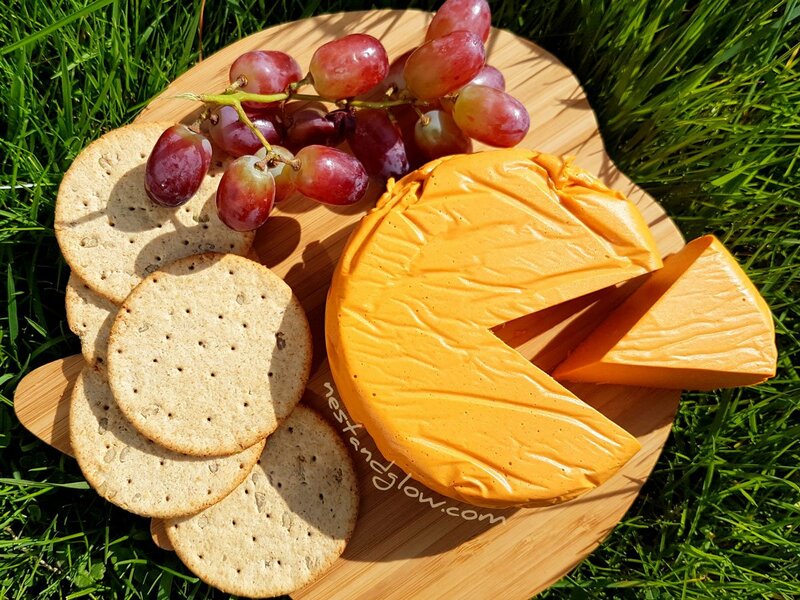 This vegan cheese is full of heart-healthy fats, vitamins and protein. 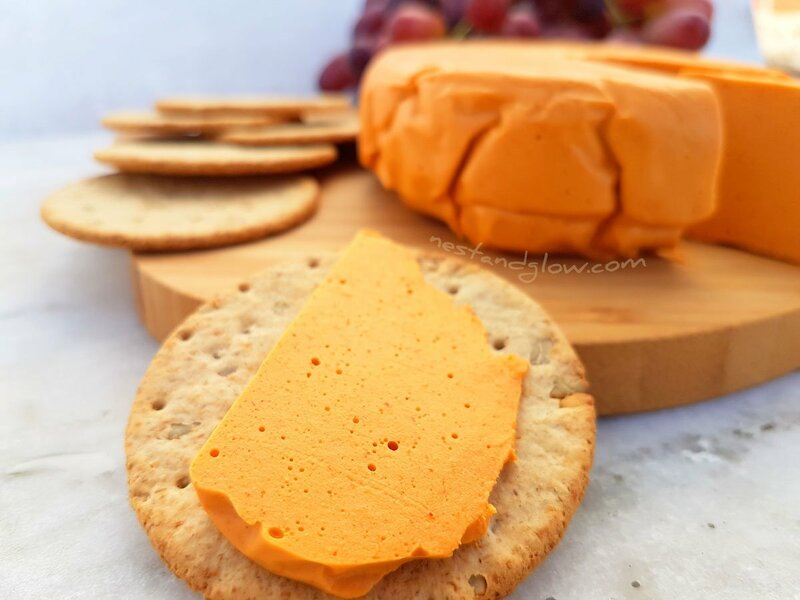 The cheesy dairy free taste comes from nutritional yeast and the smokiness is provided by smoked paprika. Quick and easy to make cashew cheese recipe that takes less than 10 minutes. If cheese stops you from going vegan try this recipe today! It slices and when baked at a low temperature it melts and goes golden. My cashew cheese recipe is one of the most popular on the site as it’s so easy and tastes great. Perfect for anyone that’s looking for a tasty cheese without dairy. It has just the right combination of creamy cashews, smokey paprika, sour lemon, spicy cayenne pepper and saltiness to be irresistible. 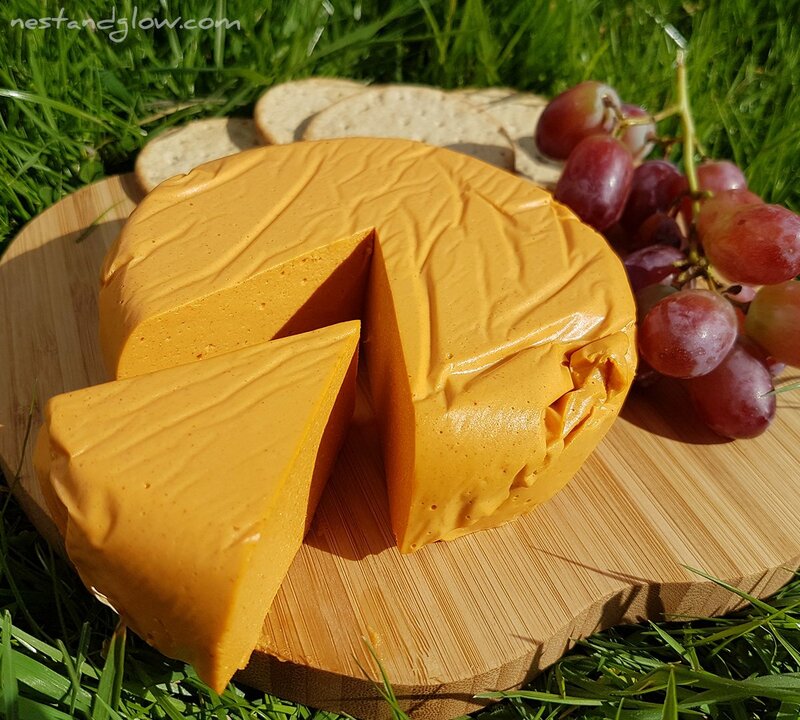 It’s perfect on a cheeseboard where everyone, vegan or not will enjoy this vegan cheese. View no music video on YouTube. 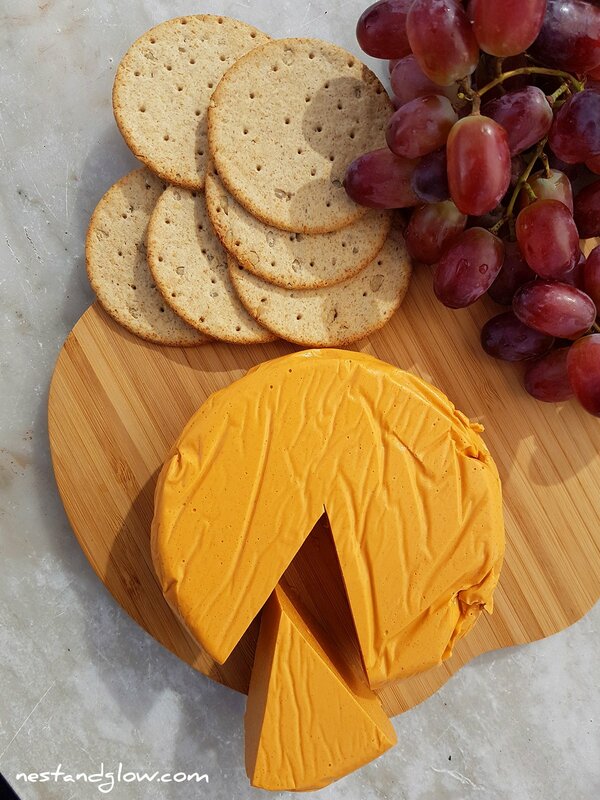 The consistency of this cashew cheese is a bit different to normal cheese – it’s best described as being similar to processed cheeses with a jelly-like texture. I lined the pan with parchment paper purely for aesthetic reasons. I was hoping to get some nice paper lines like you often get on traditional cheeses. You can just use a normal pan and it comes out easily enough without lining or greasing. Take a look at my sunflower seed cheese to see how it will come out in a normal dish or ramekin. I think it turned out really well with the paper folds in the cheese. The paper can be used to wrap it up when stored in the fridge and gives the vegan cheese an authentic look. Apple cider vinegar aslo works well in place of the lemon or lime juice. A tiny bit of sourness helps balance out the flavour of the cashew cheese. Agar agar is a natural product extracted from seaweed. It comes in several different forms – powder, flakes and bars. In this nut cheese recipe I use powder as it’s the most potent. If you are using the flakes you will need to double the amount. Similarly for agar agar bars you will need to add more, but I’m not sure the exact amount as I’ve never used bars. Agar agar doesn’t have any health concerns, unlike another seaweed extract carrageenan. This is often used in foods, even those that are organic and natural, as a stabiliser and preservative. Carrageenan does have some health concerns as it affects the digestive system, but rest assured agar agar does not. If you don’t have any agar agar you can just leave it out and make a cheese spread that has all the taste of the original recipe but just won’t slice. The maple syrup in this vegan cheese recipe is totally optional. I find the small amount balances out the flavour and works really well with the paprika and cashews. Even if you’re not vegan this cashew cheese recipe is a great healthy alternative that is good for the planet and good for you. I have several other vegan cheese recipes listed below if you want a vegan cheese without cashews. There’s no need to soak the cashews, the only nuts I don’t soak are cashews and macadamia. Cashews are a soft nut so even a 500w blender can blend them smooth. They also don’t have the absorption issues that other nuts, such as almonds have if not soaked/sprouted. Even if you have a week blender the resulting cheese is still great with cashew chunks! Some have commented that this isn’t a proper vegan cheese as it’s not fermented. This is a quick and easy cheese recipe and the flavour comes from the nutritional yeast that has been fermented so it definitely does have a cheesy taste. Nutritional yeast can be found in most health food shops. It’s rich in B vitamins and many brands contain the elusive B12. Also known as nooch, hippie dust or Brufax. It’s an inactive yeast that is made from sugar cane or beet molasses that have been grown for their nutritional properties. The nutritional yeast is important to give this vegan cheese the right cheesy taste but if you can’t source it then it still works with it omitted. Agar agar is a nutritious and safe vegan alternative to gelatin that has many health benefits including promoting digestive health and strengthening bones. Place half the water and everything else apart from the agar agar into a blender. In a pan put in the remaining half of the water and the agar agar. Simmer for 5 mins stirring constantly. Make sure no lumps of agar agar form at the bottom. Take off the heat and stir in the cashew mixture until combined. Pour into a mould and then chill for an hour. Enjoy within 5 days and keep chilled. Can be frozen to last for up to 3 months. 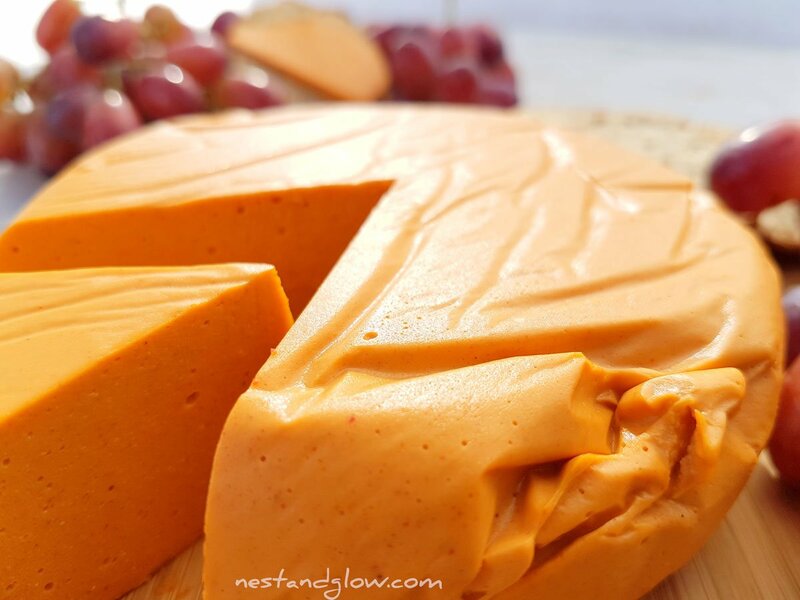 If you make this cashew cheese recipe please do tag me on Instagram @nestandglow, I love seeing my recipes created! For another vegan cheese recipe check out my pistachio cheese recipe – also vegan and easy to make (like all of my recipes). These look great! What size pan are you using for the mold? Thanks! I can’t find it at the moment but it’s about 3-4″ in diameter. I love your recipes! Thanks for sharing them. I wanted to make this smoky cheese but I cannot have agar agar or corn so would tapioca or arrowroot work as a thickener instead? Hi there, afraid not – the others wont make it able to set and be sliceable. How about leaving out the agar and making it as a dip? The recipe says to just simmer the agar, but it should be brought to a bowl than simmered and make sure you see no granulars what so ever left over cause apparently it will not set if you do. So it will be a dipping sauce then. I’ve not had issues with it not setting with my method to be honest. I don’t recommend to bring to a boil as can cause some to be stuck to the bottom, then having issues with it not setting. But if it works for you fair enough! Do you think this would be slightly melt in the oven? I want to use it as a pizza topping. You note that applecider vinegar can be used as an alternative to a lemon. How much do I use? Am I able to use gelatin powder as a replacement to agar agarr? It’s not something I would recommend as I’m vegan, but it should work – but the smell, the smell of gelatin is terrible! Just made this and put in fridge. It tastes really good. I can’t wait to use it tonight for my vegan tacos.! Thanks for the recipes, July will mark 2 yrs being a vegan and it’s people like you that have made it so successful. Amazing! So nice to hear you like it and it’s making being vegan successful! I just made this without the agar agar. My question is do you use the whole 1.5 cups of water? I only used the initial 3/4 cup. It tastes awesome! I used less smoked paprika because the kind I bought is very strong. I could use a bit less next time. It is still excellent and I will make it again and buy some agar agar for next time. Thank you. Yes I use the whole amount, although with the heating some is lost and the cashew nuts aren’t soaked so you do need a decent amount of water. Glad it worked out great for you! is this recipe Paleo friendly? I want to try this as I love cheese and anything with cheese :). I did half the recipe and used 1Tbsp of agar agar flakes bc I didn’t have the powder. Turned out perfect! Wish I could add my picture. Oh wow that’s great to hear, sorry you cant upload a photo of this cashew cheese – if you share on social media @nestandglow if you’re on any? I use raw cashew for this, you could use roasted but raw work great and are more nutritious.